The Tanya Shand Memorial Fund was established in 2015, after the tragic death of Tanya Shand in Rothesay, New Brunswick. Shand was murdered by her common law partner, Adam Priest on May 22, 2013 in the presence of their 6 year old daughter. Two years after her death, Tanya’s sister Julie and the officer who attended Tanya’s murder, Cst. 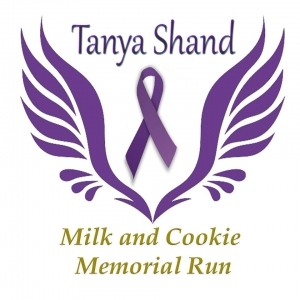 Kelley McIntyre created the first annual Tanya Shand Memorial Milk and Cookie Run to honor women in the greater Saint John area, who lost their lives at the hands of intimate partner violence. This run was created to bring awareness to our communities about the risks of intimate partner violence, while making it a family fun event. The run has also been there to support the families of the taken, families that are currently experiencing intimate partner violence and those who are surviving. Over the course of the last three years the Tanya Shand Memorial Fund has raised $26,000 for our communities, with 100 % of its proceeds going towards public education, education within schools and helping families move forward when leaving violent situations. This page will show you the amazing work that is being done in our communities to help end the silence on domestic violence. A special thanks to all our sponsors who help make our events successful and for believing in a safer community for everyone. A special thanks to all our volunteers who have made this fund what it is and continue to offer support. And last to our families who give up so much of their time, so we can continue to work in the field we do. We could not do this with out everyone's help!! From the bottom of our hearts, thank you! We look forward to working with everyone in our community. We hope that this page will inspire you to get involved with our mission - End the Silence on Domestic Violence, and LOVE IS RESPECT. If you or someone you know is experiencing intimate partner violence please don't hesitate to contact us, there is help out there for everyone.